This Saturday, April 10th I will be doing 2 presentations for our local Home Show one on Roses the other on Deer Resistance. As for the program on deer I could just say “Put in a tall, tall fence and never forget to close the gate”. Or as seen on the Curbstone Valley blog, a fence and a fence in front of a fence to keep deer out. But, there are tips to make a garden deer resistant and that will make a good topic for a post. Today, I want to share some of the pictures I will show of roses. I thought I would try my first Wordless Wednesday. But, I just had to put in some words. There is a wonderful story about the Harrison Rose. 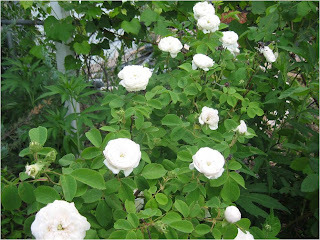 Marti Frizen of the Ashland Gazette tells the story how this rose originated in New York. It is also called the Oregon Trail rose because the women who came out west sewed roots of this rose into their long wool-linen skirts. Imagine walking across the damp prairies and keeping the roots wet enough to plant this rose when they arrived at their destination. This rose grows all over our town. When we moved in it was growing on the south side of our neglected yard. I eventually cut it out. Yes, but first I gave cuttings away. There is a Harrison rose growing in our alley, so yes I can still enjoy it’s amazing fragrance. Best of luck on your presentations. Keeping munching critters out of the garden always seems to be a popular topic. Your roses are splendid, I'll have to snoop around and see if I can find any of them here. Hopefully all your lovely roses have survived the winter. I am sure you have methods to protect your stock over the winter in terms of pruning and protection? Hi Christine - Yes, I am hoping the seminar goes without any powerpoint glitches. Paul, I make sure to grow really tough roses. I don't do anything at all for the old roses (pre 1867 introduction) Those roses are survivors. For the others I might mulch them with leaves after the ground freezes. They always survive. They don't grow as tall as they would grow in warmer regions but I love them. We are so dry that diseases aren't a problem. I do feed them with alfalfa pellets, compost and banana peels. A little epson salt for magnesium is also good for them. Noelle, the story of the Harrison rose is sweet. I can just imagine the pioneer women dragging those long skirts. I think knowing that you had little root starts in your hem would make the mess tolerable. Those women were so tough and determined. They could bring so little with them. A rose from home would be such a comfort. Gloria, thank you so much for the link. I hope our saga helps others in a similar predicament. I just posted round two of our battle. So far the deer are winning, but I'm determined that we'll ultimately emerge victorious! Good luck with your presentations this weekend! 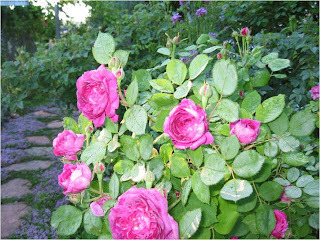 What beautiful roses, especially Reine de Violettes. It sounds like the perfect rose! I wish I could grow them but the deer eat them in my garden. Hi Clare, I plan to talk about your saga at my presentation. Debbie, I used to have 30 roses in my front yard. The deer ate the teas but left the shrubs alone. I have been removing most of the roses from the front yard. I have deer resistant plants in front and I have seen them walk by my yard with all it's blooms and go the the next lawn. But if they are starving, which they are not when the flowers are blooming, they will eat anything. Kate, I will add those flowers to my list. We grow similiar plants. I too wish you could be here. It would be fun!!! But, I hope to meet you and have you meet my garden this summer! The Harrison rose is beautiful. I shudder to think of all the roses I don't even know about and would not grow in South Louisiana anyway. I dont' have a deer problem but aphids and thrips are a problem. I want to be a toxic free gardener but when those little bugs eat my roses I give up and spray. Any solutions to that ?? Dear Gloria, I do so wish you well with your talks on Saturday. I am sure that you will be very well received as your plant knowledge is clearly extensive and comes from first hand experience. The roses you show are lovely, particularly R. 'Reine de Violette. If you are looking for a white clematis, then you may like to consider C. 'Henryi' which flowers in June and again in September. Thank you for leaving a comment on my latest posting to which I have replied. Gloria, Your roses are beautiful. I grow several hardy types up here, Good luck with your presentation. I hope your presentations go well. The roses are beautiful, I used to grow roses before we moved to this sandy site. Thank you for leaving comment on my post. Have a great weekend. Reine de Violettes is gorgeous! I grew this rose for a number of years and was saddened when it succumbed to disease. Our humid, hot climate is tough on a lot of roses, but some do well. I like thornless roses, and I like old fashioned, big blowzy roses. Those pioneer women loved their roses too, didn't they? I am sure something beautiful from back home brightened their spirits. Gloria your presentation today was marvelous...but I wish you had been scheduled for an hour or two. If you ever do any more programs I would love to be able to attend. Your gardens are just beautiful. Thanks so much for sharing. Kelly - Today it is sort of raining. Our spring snow doesn't last but a bit. We only get about 17" of moisture, so we are dry. We have beautiful non humid summers, lovely autumn, pretty spring but winter is not my favorite!! Hi Gloria, it is so pleasant and amusing reading your posts, made more pleasant and enticing by your beautiful photos. 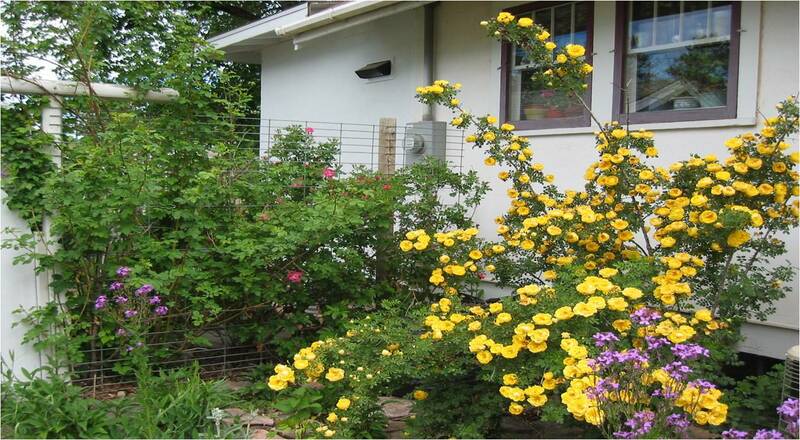 I love those yellow roses, no branch is left without flowers! How i wish i live nearby so i can ask you for some cuttings. They are really marvelous! ...and i love the cute stories! I'm glad your presentations went well ... I have one to do myself in two weeks. It's great to talk to people and 'demystify' roses. Most people can grow them, there's just a few things that they should know and do to be successful. The historic angle of so many of them is icing on the cake. (Harison's Yellow is a great story) I can see that I'll be spending a lot more time here!